The eyes of the European golf industry are set to be on Quinta do Lago in October 2014 when it unveils its eagerly-awaited totally revamped North Course – predicted to become one of the new stars of European golf. Redesigned by renowned American architect Beau Welling in close collaboration with European Ryder Cup captain Paul McGinley, the new layout has been built to the highest specifications with a €9.6m investment programme and is in line to become the new number one course at the prestigious family resort. The North Course has been redeveloped with the emphasis firmly on precision and strategy. While many modern-day developments tend to focus on length, Welling and McGinley have been keen to design a golfing experience where accuracy and course management are the key factors, and a course that is playable and fun for golfers of all abilities. Welling, who has worked on more than 90 projects worldwide, said: “We have kept the routing of the North Course intact, but we have totally reworked the golf experience within the existing corridors. Specifically, we have worked very hard to make the experience more playable for higher handicappers while at the same time created precise target areas for the better player looking to score. “Paul has been great to work with. He is very passionate about golf in general, but he has a particular and keen interest in Quinta do Lago. Among the changes introduced on the 6,776-yard course which has been closed since last December, all greens, tees, bunkers, irrigation, drainage systems and cart paths have been rebuilt using the latest state-of-the-art technology, with four sets of tees introduced on each hole to accommodate players of all levels. With the existing turf on all tees, fairways and greens having been stripped back, the final figures for completing such an ambitious project make impressive reading, with 379,800 tonnes (211,000 cubic metres) of earth moved on site during the redevelopment. While the routing of the course has not changed, Quinta do Lago has addressed golf course strategy to make the par-72 layout significantly more playable for all golfers, while still being a challenging test for the better players. A low-cut Bermuda grass approach has been introduced around greens to create a myriad of recovery shot options for increased satisfaction on all levels of play. The aesthetics of the golf course have also significantly improved through the introduction of a cool season rough grass and the select planting of native grasses and specimen trees to help the environment. The renovation has also allowed Quinta do Lago to further reduce the impact on the environment by using recycled water and solar energy to maintain the course. The reduction of grassed areas will lessen the impact on the environment and the new design will include the creation of some new animal and plant habitats. 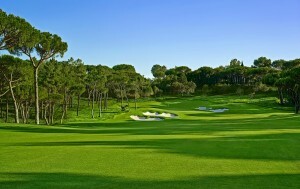 John Dwyer, chief executive of Quinta do Lago, said: “I think people will be blown away by the North Course. It is going to be very different but very playable and a real challenge, and it will be one that members and visitors will want to play again and again. Set amongst 2,000 acres of the picturesque Ria Formosa Natural Park, Quinta do Lago is one of the most highly regarded golf and residential developments in the Algarve since opening in 1972. Located just 15 minutes from Faro airport, the resort offers residents and guests an unparalleled location benefiting from a year-round temperate climate, a variety of lifestyle pursuits and a strong sense of community. Since its inception, Quinta do Lago has been at the forefront of European golf with three 18-hole championship courses – Quinta do Lago North and South courses and Laranjal – matched by outstanding practice facilities at the Paul McGinley Academy and the new TaylorMade Fitting Center, which gives golfers the chance to enjoy the ultimate club-fitting experience by providing them with the tools and techniques used by professionals on tour. Away from the fairways, the resort’s extensive leisure facilities guarantee there is plenty to keep everyone occupied with events, tennis, cycling and watersports just some of the activities available. Quinta do Lago’s stunning location by the beach offers the perfect place to relax and unwind while the resort’s wide array of restaurants, both formal and informal, take advantage of the fresh Mediterranean produce that the region has become famous for. Due to the integration of the North Course in the Ria Formosa Natural Reserve there has been a huge focus on environmental impact of the redesign. This influenced the total investment of €9.6m, but was a decision management made with a concrete objective in mind – contributing to the efficiency, sustainability and future of the resort. •	More than five hectares (50,000m2) of new natural habitat was created by the inclusion of weeping love grass. •	This species requires little irrigation and thus is more efficient, as less grass areas mean less irrigation. •	The redesign has encompassed more natural habitat around the course including mainly native species. •	More than 1,000 new umbrella pines and 500 native cork tress will be introduced as part of a 5 year planting programme. As part of the project, a brand new drainage system was designed to harvest rain water, where feasible, and redirect it to irrigation lakes. The estimated recovery capacity of the new drainage system is 50,000 m3. This allows us to recover an average of 26 per cent of the total annual water necessary for irrigation, which is particularly important when taking into consideration the Algarve’s delicate water supply. Another action taken was the increase of the total water holding capacity on-site. The Quinta do Lago lakes were expanded from 24,000m3 to 37,000m3. This is a dramatic increase in the water storage which can then be reused. Provisions have also been made to use water from the recycling plant. The largest lake located on the 12th hole of Quinta do Lago’s North Course, has a holding capacity of 26,000m3 and the highest elevation. The redesign of the course has catered to the gravity feed of this lake ensuring feeding to all other lakes on both the North and the South Course. This gravity feed dramatically reduces the requirement for pumping water, thus contributing to both the sustainability and overall carbon footprint of the resort. A new irrigation system (more than 260km of cabling) was installed contributing to the overall efficiency of water use. An older irrigation system potentially loses on average 8 to 12 per cent of water through infrastructure quality and degradation. The new system maximises efficiency and water use. The introduction of soil moisture sensors, together with a Toro links remote control system that can be operated by any smart phone all over the world, allows for precise monitoring and management of soil moisture on a real-time basis.